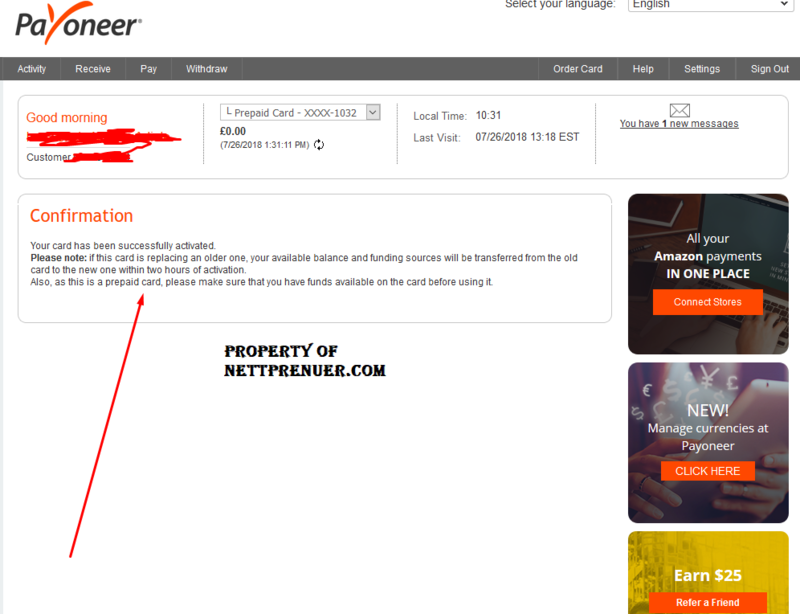 Have you received a Payoneer MasterCard, and you don’t know how to activate your Payoneer MasterCard yet? Freelancers all over the world have been making use of Payoneer Mastercard over the years to receive payments from clients in exchange for services rendered. According to Wikipedia, Payoneer is a financial services company that provides online money transfer and digital payment services. With Payoneer, account holders can send and receive funds straight into their bank account, Payoneer e-wallet, or onto a re-loadable prepaid MasterCard debit card that can be used online or at points-of-sale(POS) machines anywhere in the world. The company also specializes in facilitating cross-border B2B payments, by providing cross-border transactions in at least 150 local currencies worldwide, taking advantage of its strong banking network around the world to make local bank transfers. Ordering a Payoneer MasterCard is very easy, and it takes at least four weeks for your card to be shipped to the address you used when signing up. However, once your Payoneer MasterCard arrives, you need to activate it before making use of it to make payments online or receive payments from clients for services rendered. 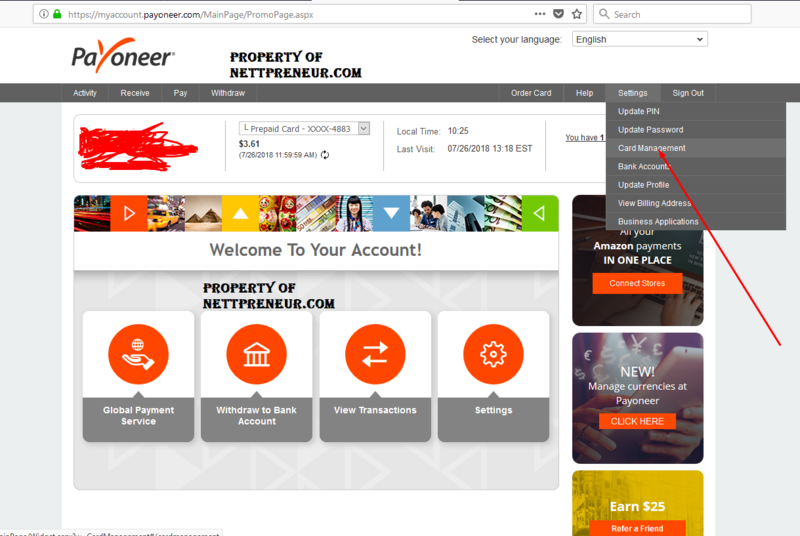 In this article, i will be guiding you through the steps on how to activate your Payoneer Mastercard in 5 easy steps, you can also check out my article on How to Verify a USA Paypal Account with Payoneer. Step 2:Click on card management option which appears from the settings drop down menu. 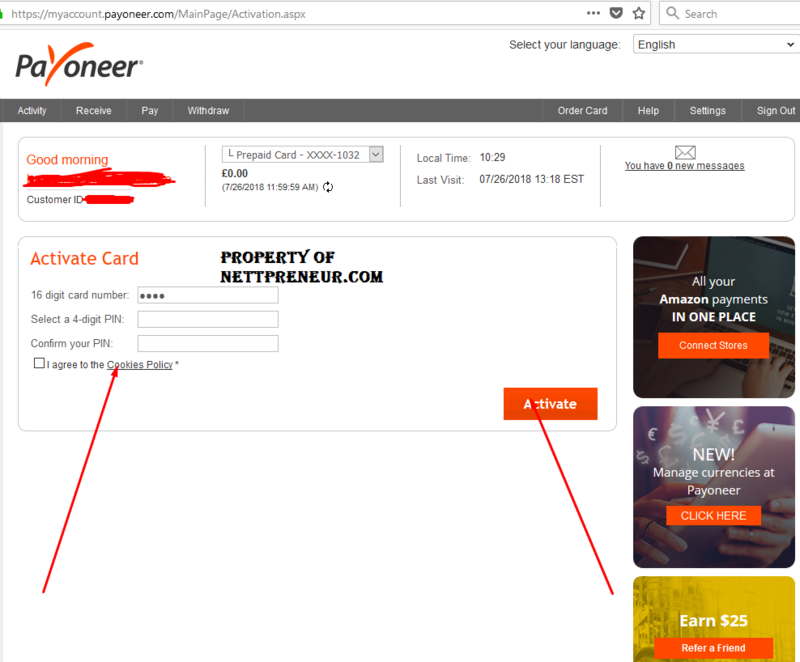 Step 3: After clicking on the card management option, a new window opens up showing you all the payoneer cards linked to your payoneer account, to enable you select which of the payoneer cards you want to activate if you have requested for more than one. 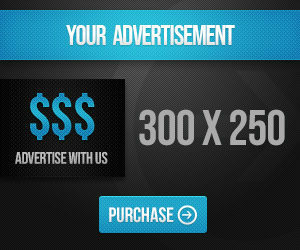 Click on the blue “Activate “ button as shown in the screenshot to proceed. 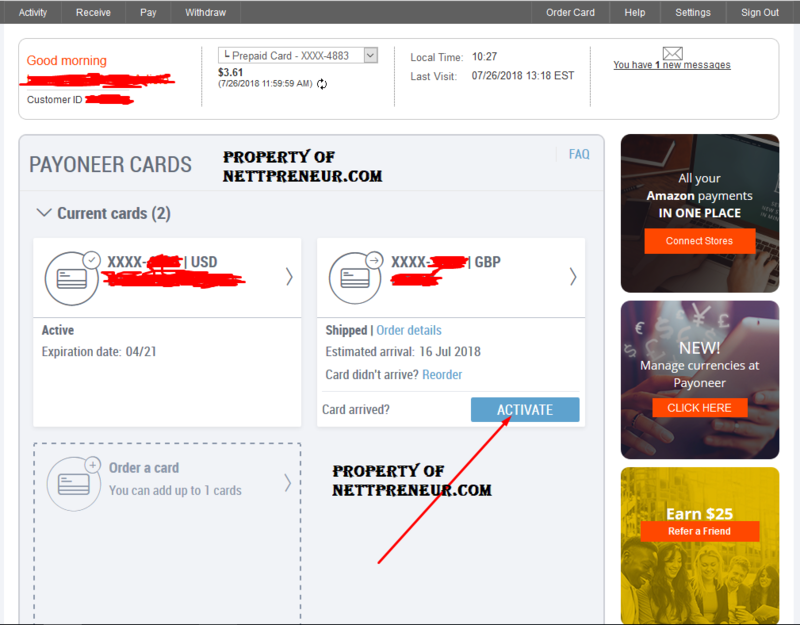 Step 4: Clicking the activate button opens up a new page for you to input the 16 digit card number which you can find on your payoneer card. You also need to generate a unique four digit pin known only to you; as it would come in handy if you want to make online purchase with your payoneer card or if you want to withdraw your funds from an ATM machine. Step 5: Proceed to confirm your four digit PIN as shown in the screenshot above, and tick the “I agree to The cookies Policy box’ before clicking on the red “ACTIVATE” button at the bottom right corner to proceed. Please note: If this card is replacing an old one, your available balance and funding sources will be transferred from the old card to the new one within two hours of activation. Also as this is a prepaid card , please ensure that you have funds available on the card before using it to shop online”. N:B Remember to write down your 4 digit pin or save it in a safe place , just in case you forget it. If you have any issues with activating your Payoneer MasterCard, kindly leave a message in the comment box, and i will reply ASAP. Don’t forget to share this post across your social media profiles to help people who might need this. Remember, Caring is Sharing and Sharing is Caring.